For many of us the New Year brings a promise to get fit and to stay that way. There are plenty of reasons (or excuses) we don’t follow through on this promise, but for those who take up running, the right equipment can certainly help. First of all, the right running shoe can make a huge difference to the way that we run and can also help reduce the risk of injury. To find the right shoe, it’s often helpful to determine what foot type you are. For the purposes of this very basic and pretty unscientific test, take a shower and then walk as normally as you can (no strutting) across a tiled floor. The footprints you leave can give an idea of your foot mechanics. 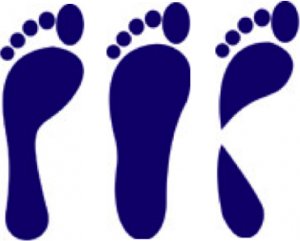 Normal Foot– there is a “flare” visible on the instep of the foot but also a clear band between the fore and hindfoot. This is considered the norm as it indicates there is an appropriate degree of movement in the foot without hypermobility. Neutral shoes are the best option for people with this kind of foot- but make sure your arch has some degree of support. 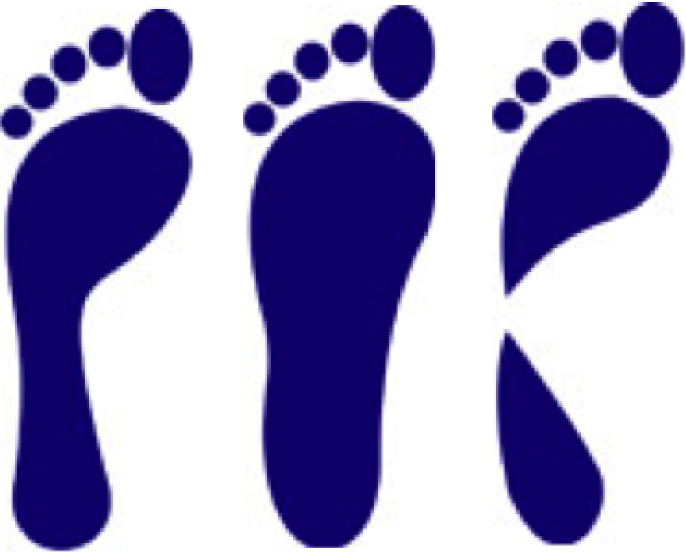 Flat foot or pronated– this type of foot has a much less clearly defined shape on the instep. It is common in people with hyper-mobile foot ligamenture. As the foot joints move more than desired, it is imperative that the foot is supported by a sturdy shoe with a good arch support. Look for a shoe with high stability features to prevent over pronation (rolling in) of the foot. This foot condition is very common and can lead to a number of complications such as knee and low back pain making supportive shoes a must. High arch– Again a flare is present on the instep but with a high- arched foot there is a loss of the band between the forefoot and hind-foot. This is often an indication of the joints of the feet being hypomobile (not moving as much as they should). Because of the lack of movement in the foot a flexible shoe can be a great option to encourage more mobility. Picking the perfect pair of trainers can be very difficult and there are plenty of places that offer a bespoke fitting service and can be worth paying that little bit extra for. Barker’s of Ringwood (www.barkers-ringwood.co.uk/) do offer such a service although they are closing at the end of January. For more information or advice please contact us at info@ringwoodchiropractic.co.uk or call 01425 474046. Dr. Gert Bronfort and his team has recently published a study on various treatments for neck pain in the Annals of Internal Medicine. One of the results that came out of this study is that chiropractic care works much better for neck pain than drugs. The study also showed that simple home exercises and patient advice works better than drugs. This is good news for chiropractors and their patients suffering from neck pain since exercises, advice and spinal manipulation are main ingredients in most chiropractic treatments. The study has received considerable attention. Here is what the New York Times wrote. Here is the study itself. With the start of autumn comes the parade of television shows to keep is glued to the television until Christmas. For many there is nothing better than curling up on the settee for hours but for others sitting for prolonged periods especially on soft cushions can be a recipe for back pain. Take breaks- make the most of the advert breaks to get yourself up and moving around and try to ensure that you spend no more than 30-45 minutes sitting at any time. Change your sitting position- studies suggest that rather than sitting with perfect posture, the best thing for low backs is changing your posture every 15-20 minutes. This limits the strain being put on one individual muscle groups and helps to spread the load. Cheat. Rather than relying on your lumbar musculature to hold you upright try using a small cushion, bolster or a rolled up towel to prevent excessive slouching. Place the support in the small of your back to help support your back in a neutral position. These tips are designed to help those who struggle with low back pain. Sitting for prolonged periods can increase the amount of strain the structures of you low back encounter by a factor of ten compared to standing. So it’s obvious to see why its such a common cause of back pain. Due to the fact that more of us sit whilst at work all day, back pain which is worsened by sitting is become a very common sight in chiropractic practise. Fortunately, using a combination of manual therapy, exercises and advice, you needn’t suffer. If you experience low back when sitting for prolonged periods, and would like further information or help, please call us to discuss it on 01425 474046.